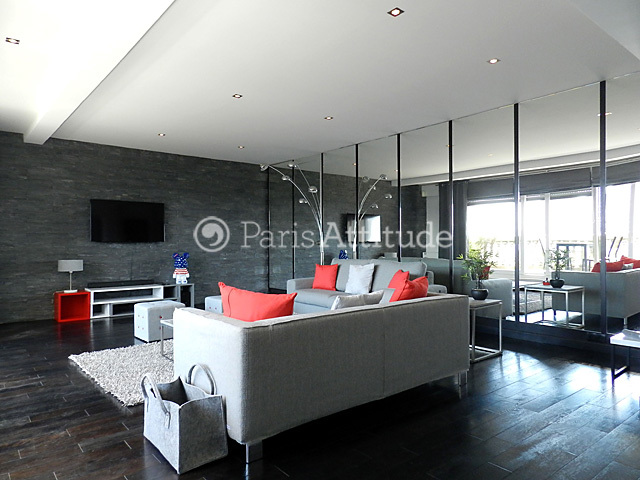 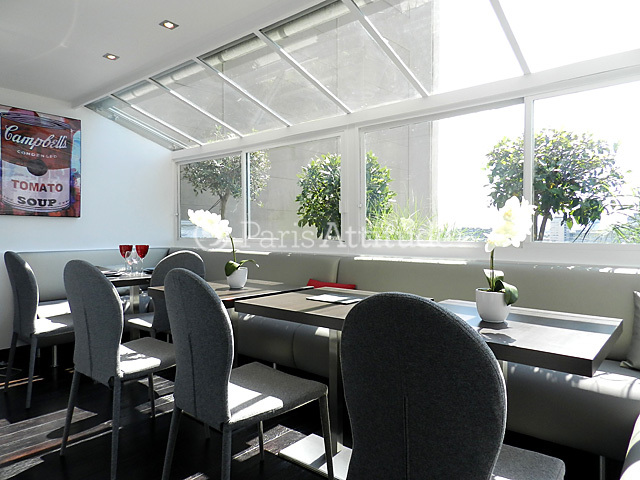 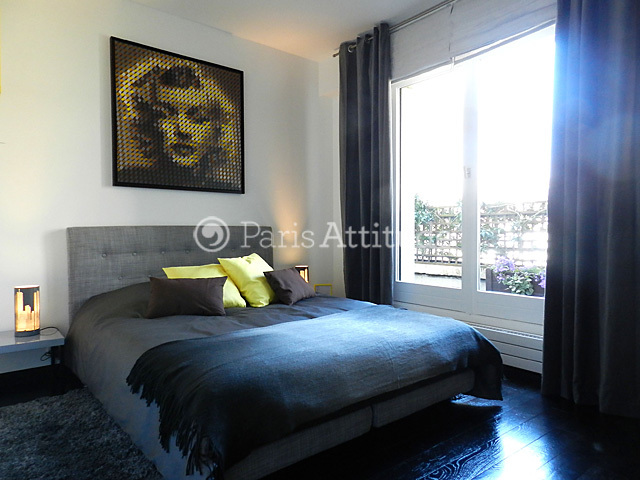 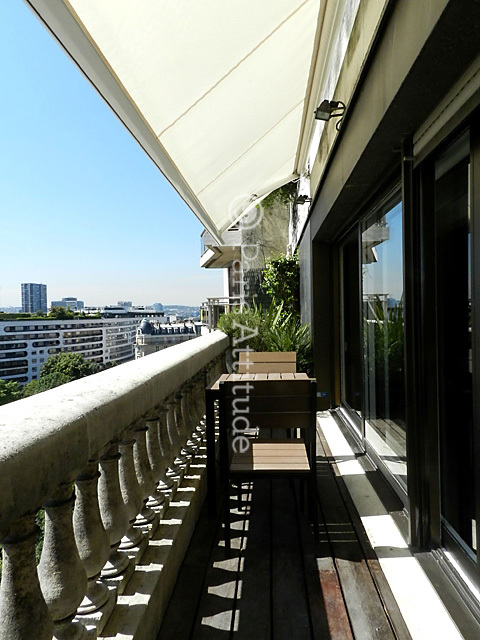 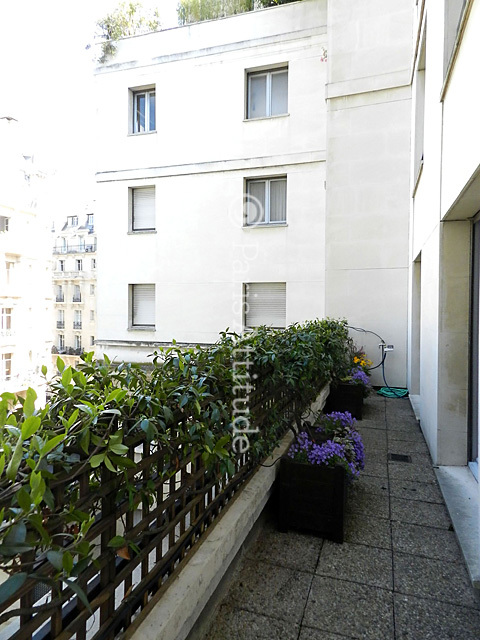 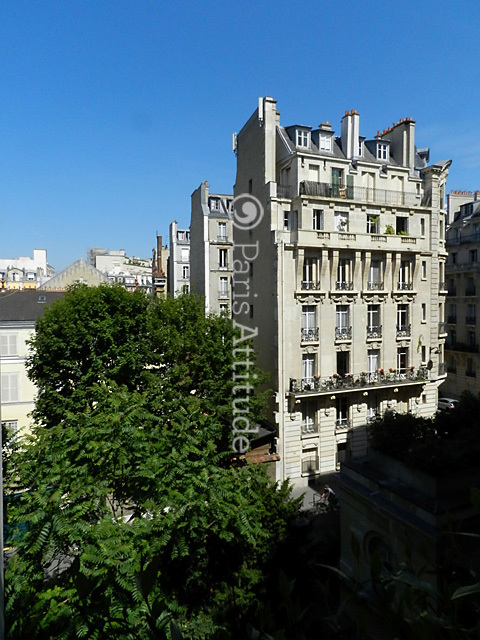 This luxurious 158 square meters , 3 Bedroom, apartment is located on rue Raynouard in the 16th arrondissement, on the 5 th French floor of a 20th century building and it sleeps 6 people. 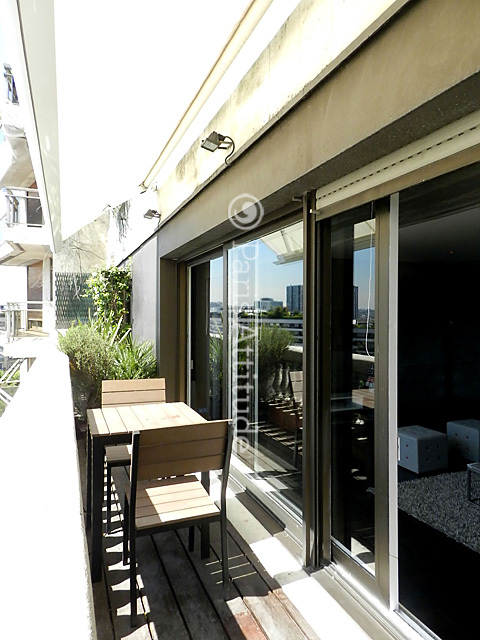 This apartment is equipped with : A/C, washer, dryer, dishwasher, cable, TV, unlimited high speed internet access with the wifi, terrace, balcony, phone. 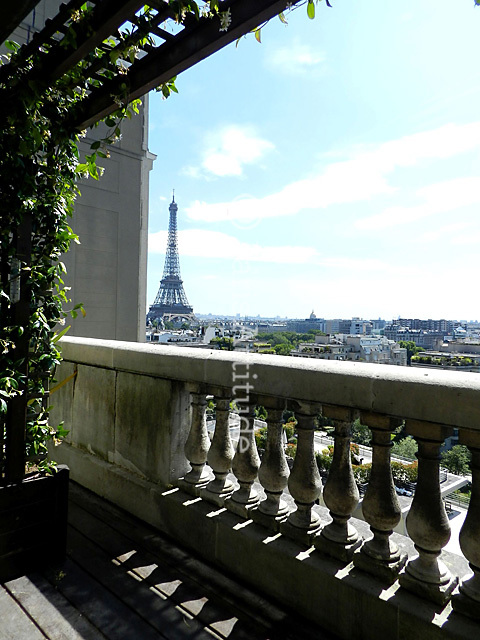 The 20th century building is equipped with : elevator, 2 security codes, intercom. 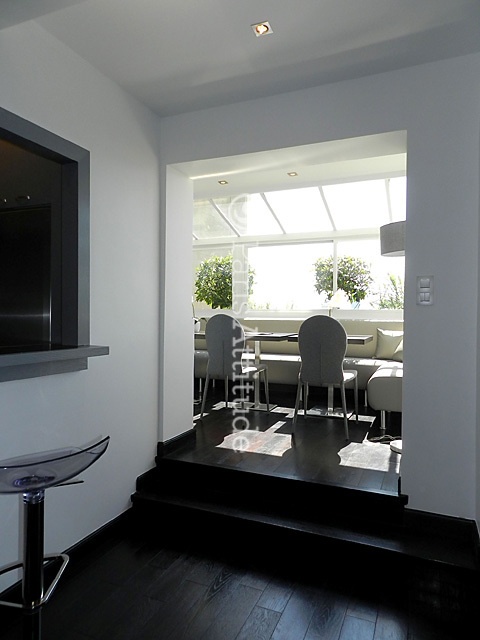 The 20 square meters entrance hall leads directly to the kitchen and the living room. 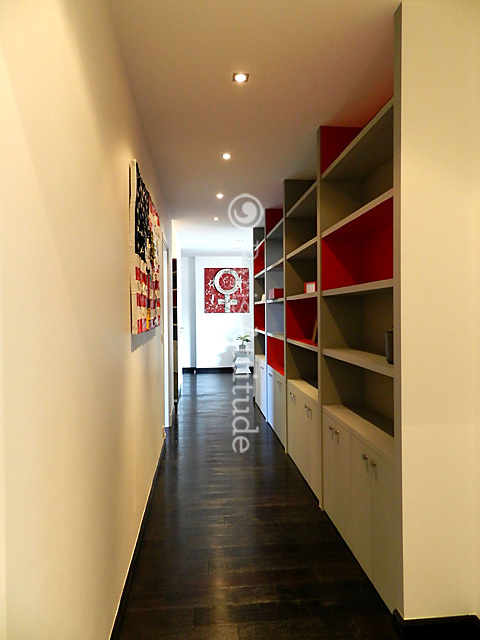 Its corridor leads to the bedrooms. 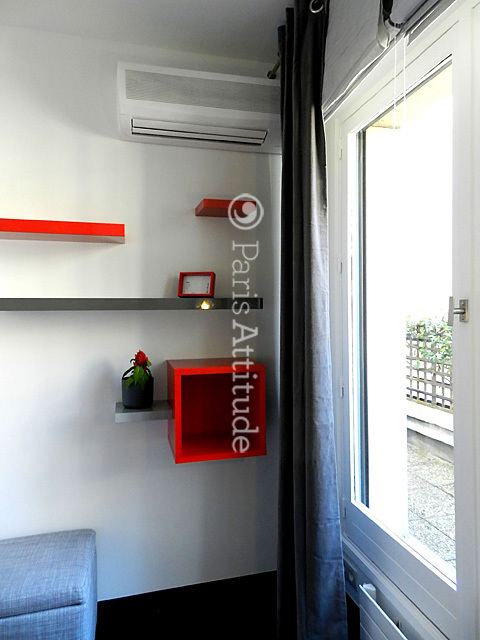 The 40 square meters living room has a bay window leading to the terrace . 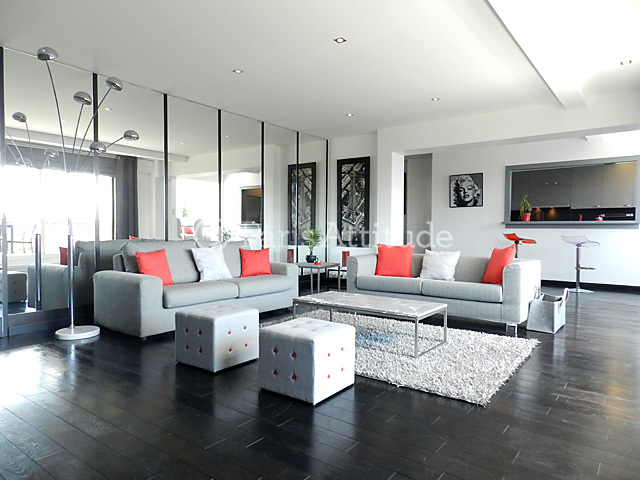 It is equipped with : sofa, double sofa bed, coffee table, cable, TV, hard wood floor. 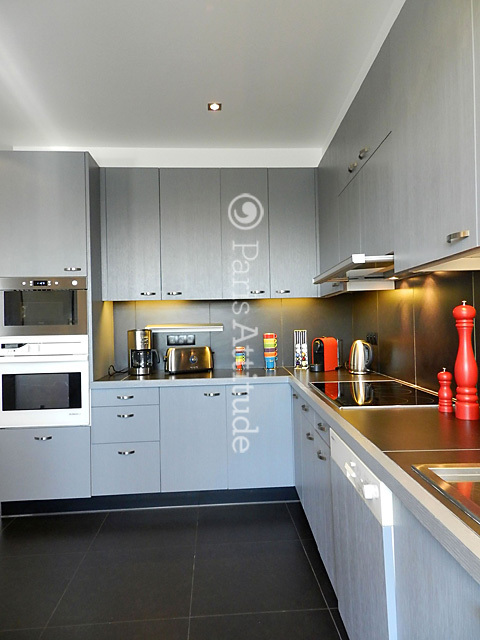 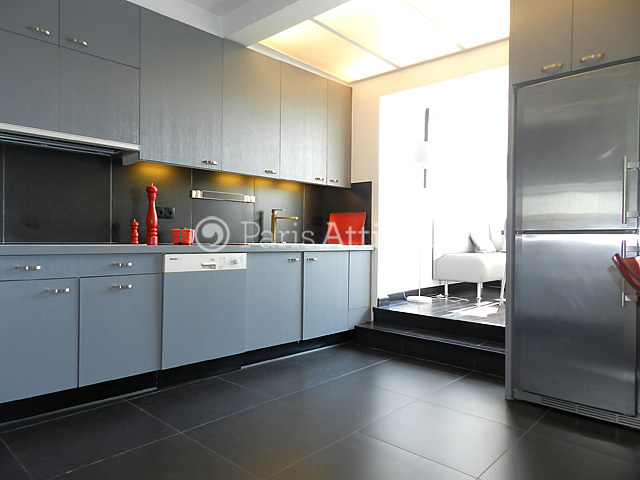 The 15 square meters separated kitchen is equipped with : fridge, freezer, dishwasher, Induction hob, extractor hood, oven, microwave, coffee maker, kettle, toaster, and all kitchen utensils, built-in wall closet, tiled floor. 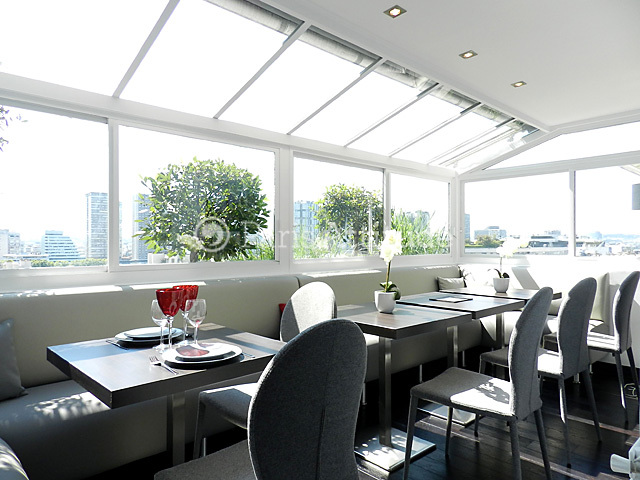 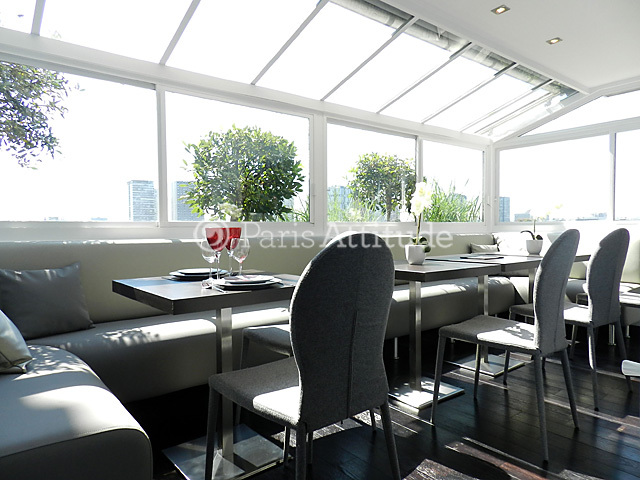 The 13 square meters dining room has a bay window and it is equipped with : dining table for 10 people, hard woo floor. 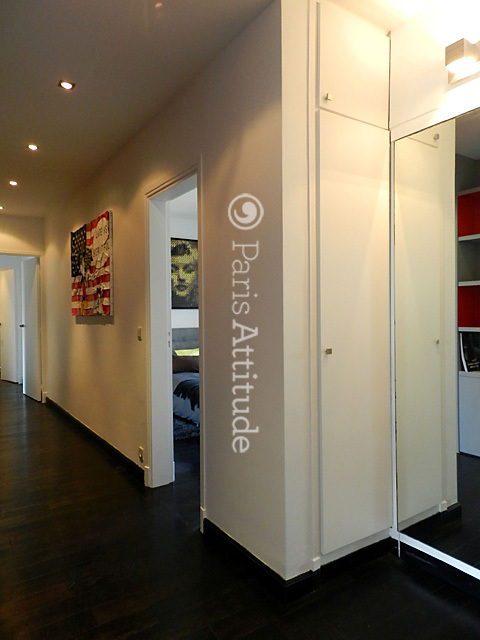 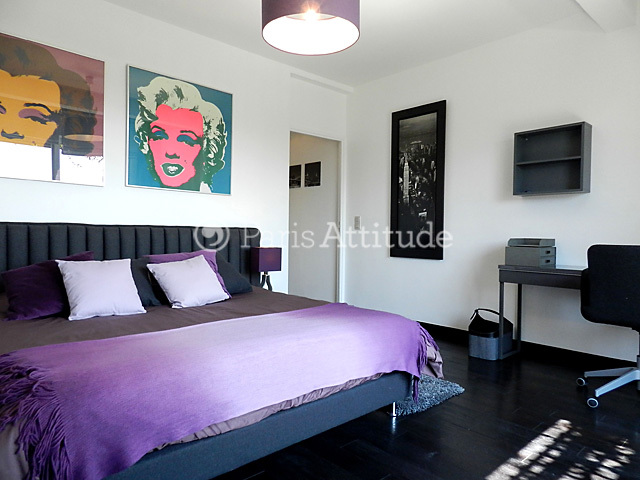 The 20 square meters bedroom has a double glazed window leading to the terrace and has a view on the Eiffel Tower . 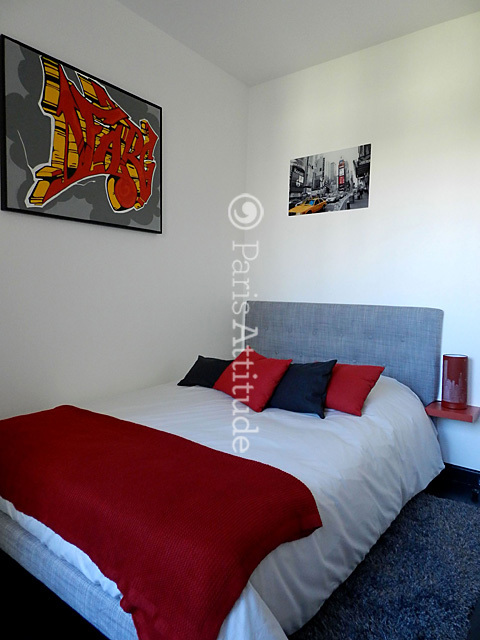 It is equipped with : A/C, queen size bed (1.80m), 2 bedside tables, TV, desk, hard wood floor. 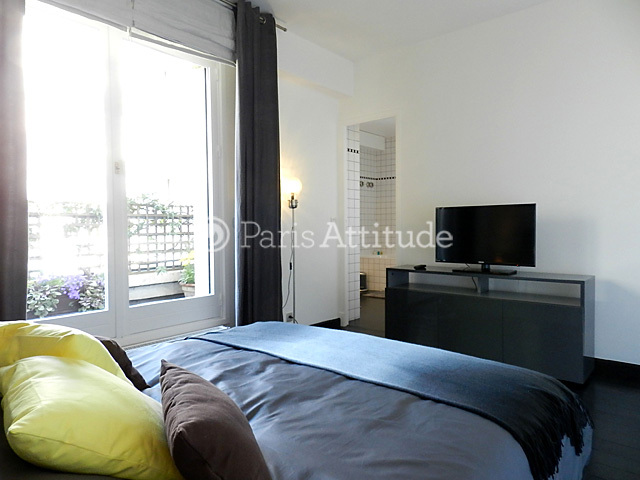 The 12 square meters bedroom is contiguous to the bathroom 2 and has a double glazed window leading to the balcony . 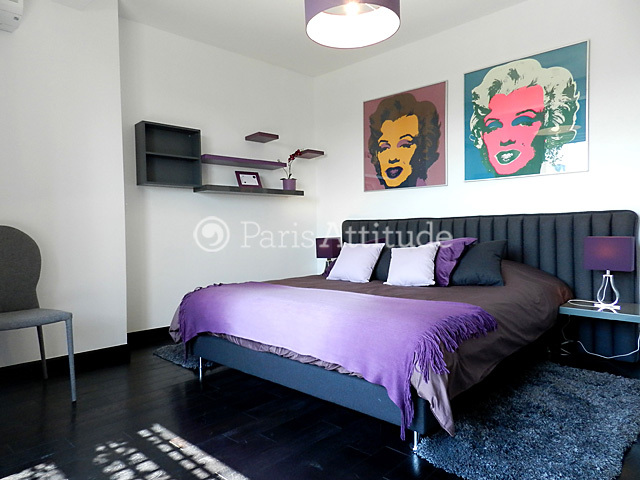 It is equipped with : european queen size bed (1.60m), 2 bedside tables, TV, built-in shelves, hard wood floor. 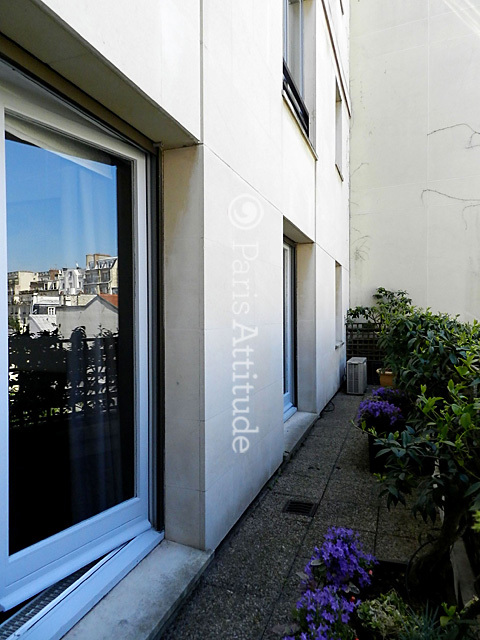 The 9 square meters bedroom has a double glazed window leading to the balcony . 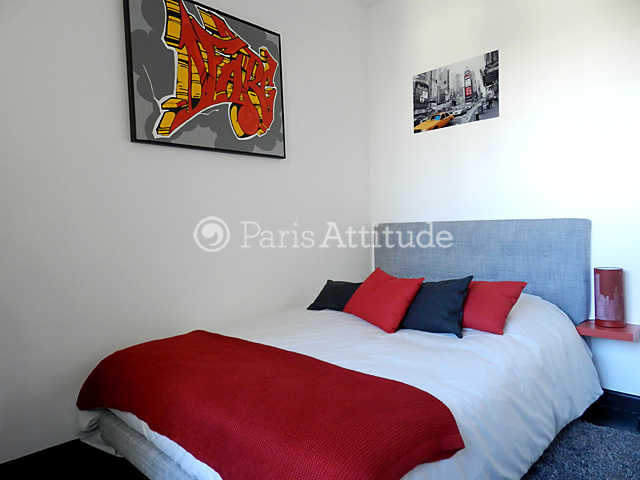 It is equipped with : double bed (1.40m), bedside table, TV, hard wood floor. 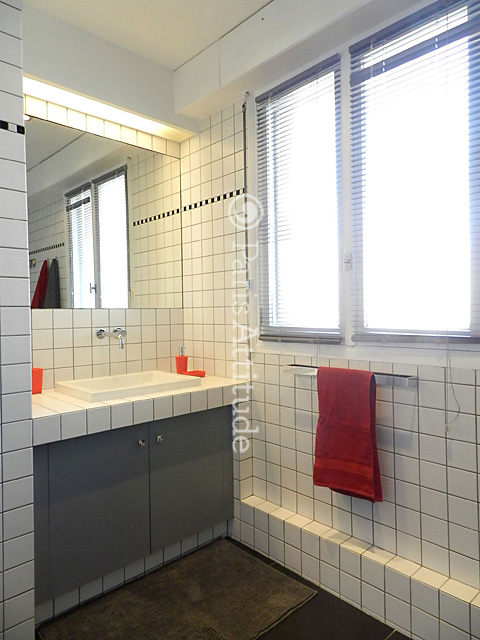 The 8 square meters bathroom has a double glazed window facing street . 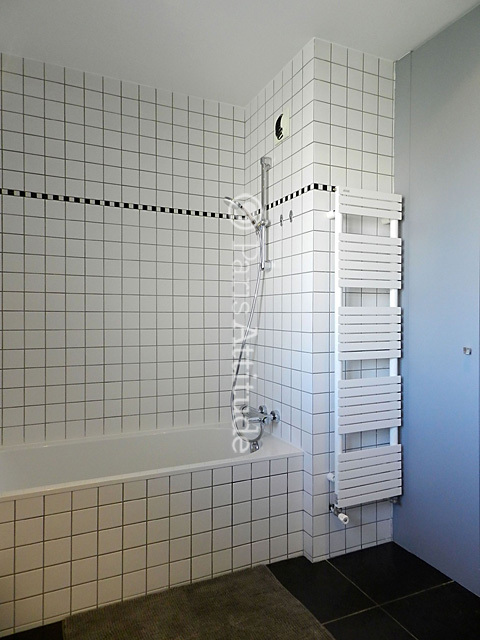 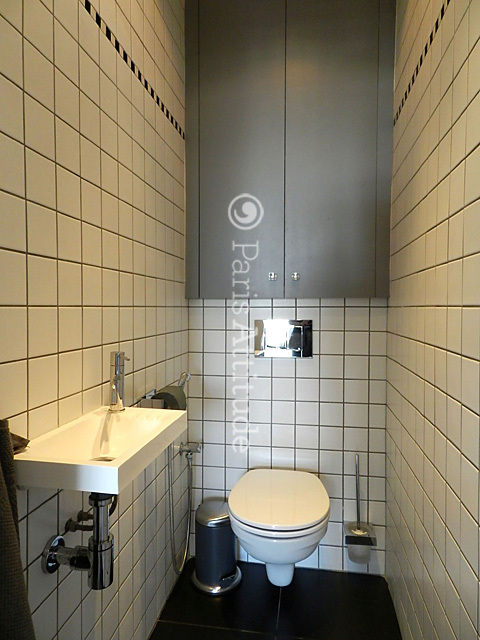 It is equipped with : 2 washbasins, shower, jacuzzi bathtub, tiled floor, 2 separated toilets in the apartment. 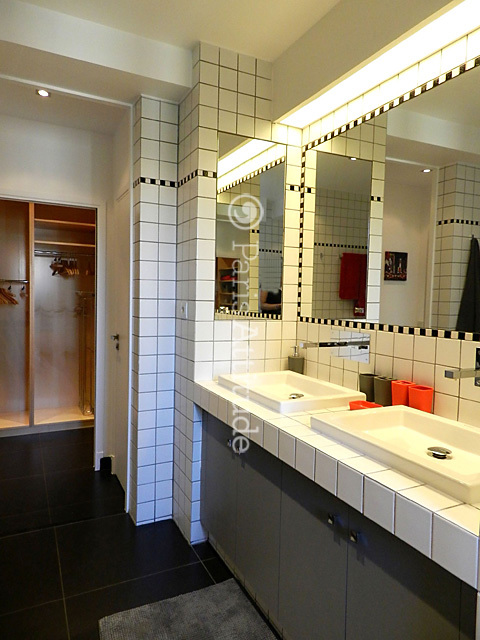 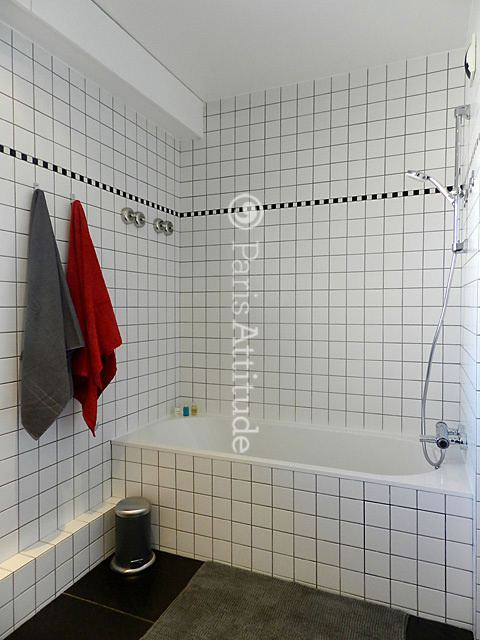 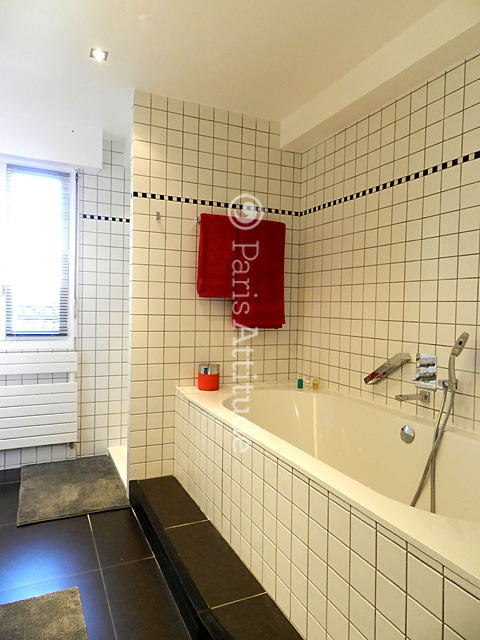 The 8 square meters bathroom is contiguous to the bedroom 2 and has a double glazed window facing street . 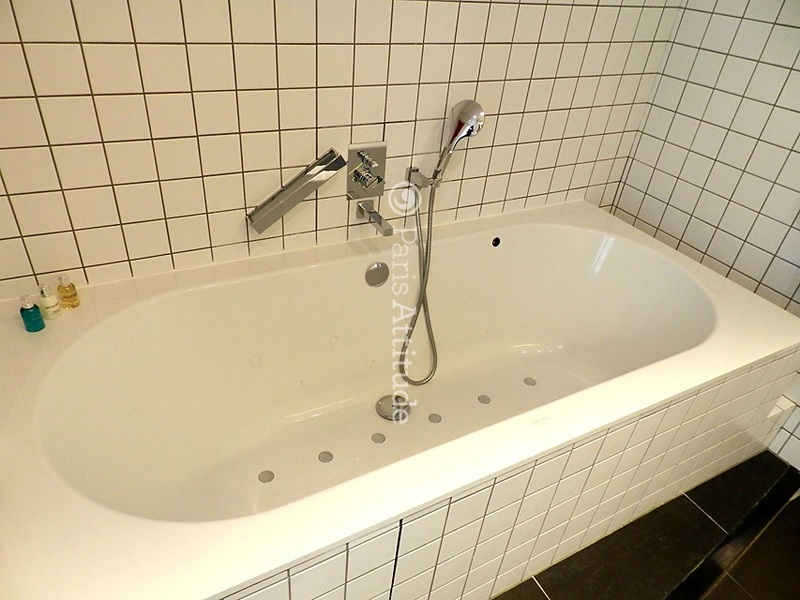 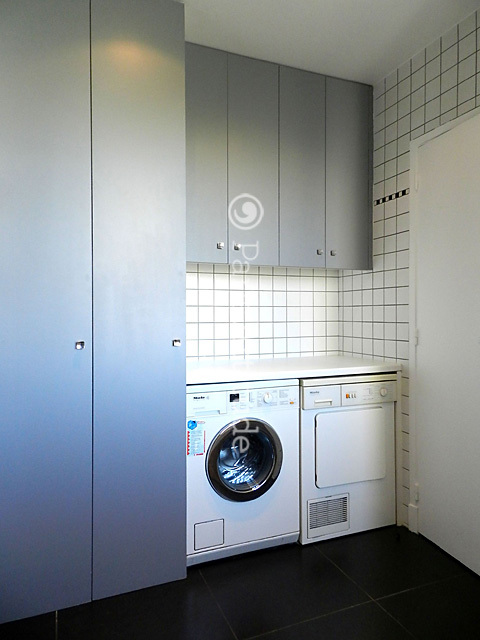 It is equipped with : washbasin, bathtub with showerhead, washer, dryer, built-in wall closet, tiled floor. 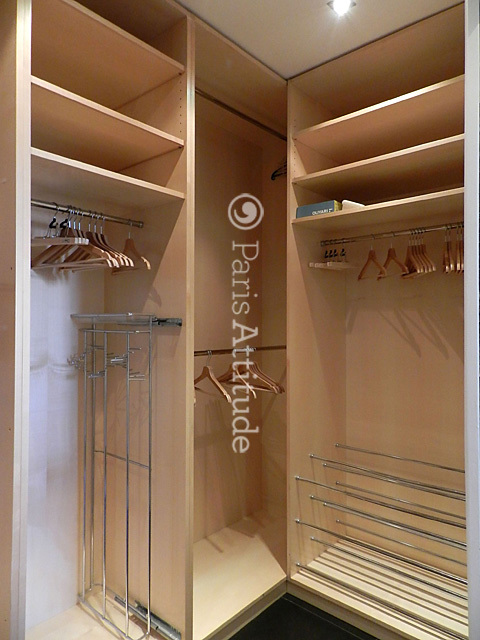 There is a 5 square meters walk-in closet beside bathroom 1 and bedroom 1. 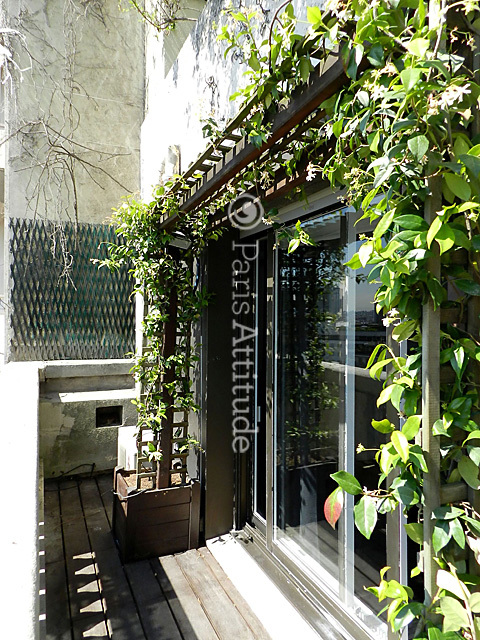 There is a 11 square meters terrace contiguous to the living room and bedroom 1. 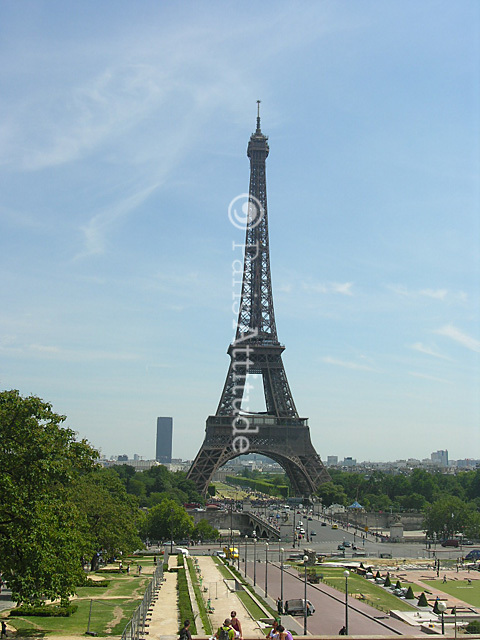 It has a beautiful view on the Eiffel Tower. 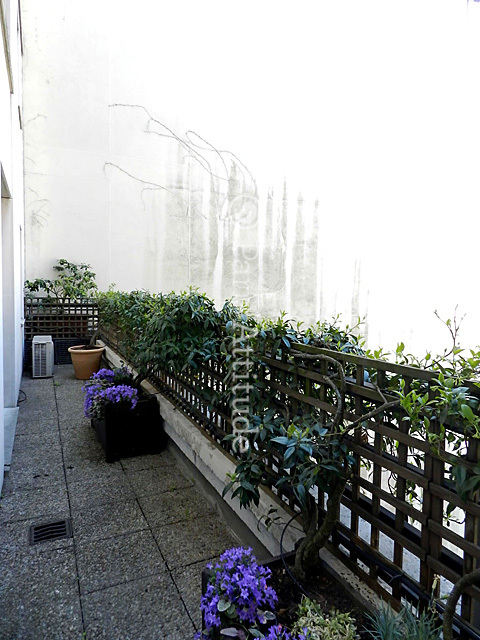 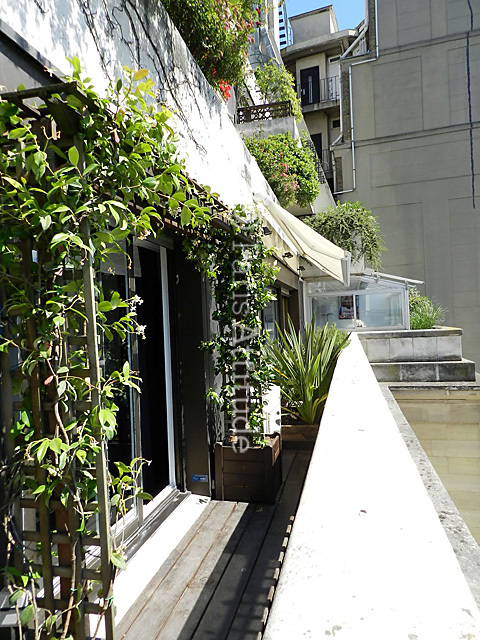 The apartment has a flowery 10 square meters balcony contiguous to bedroom 2 and 3. 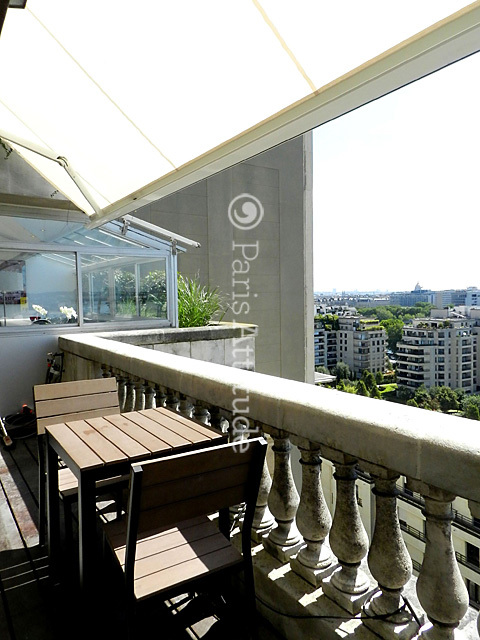 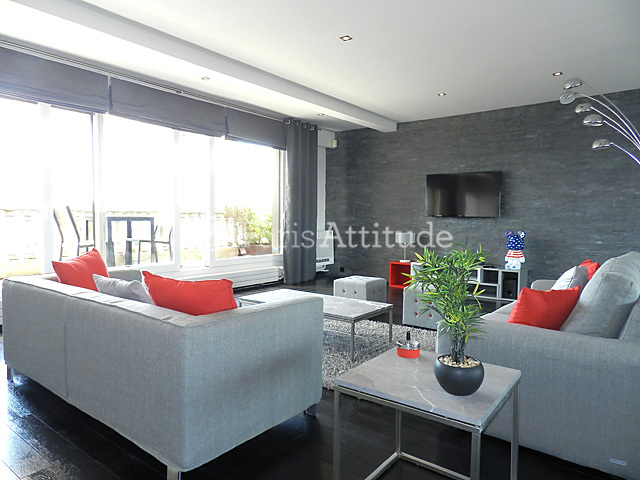 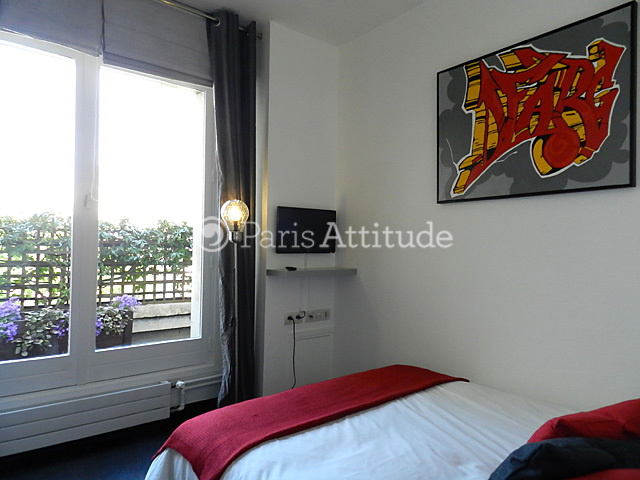 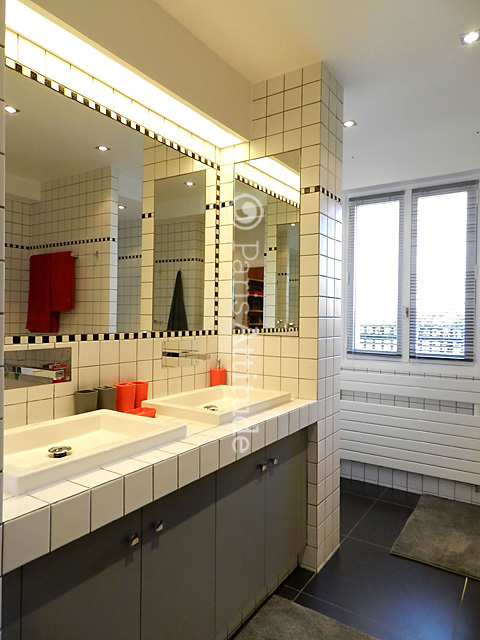 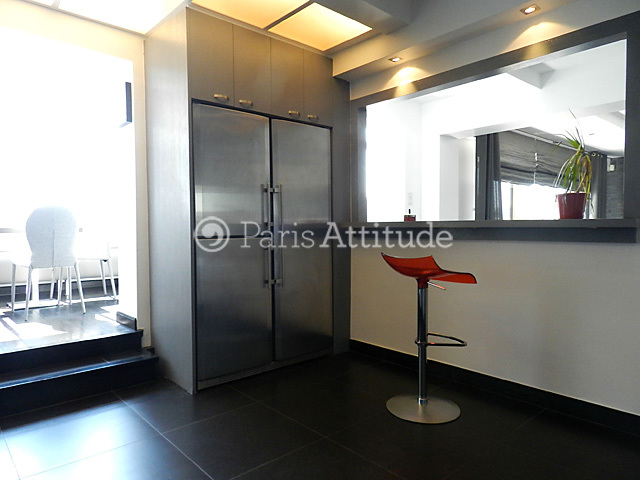 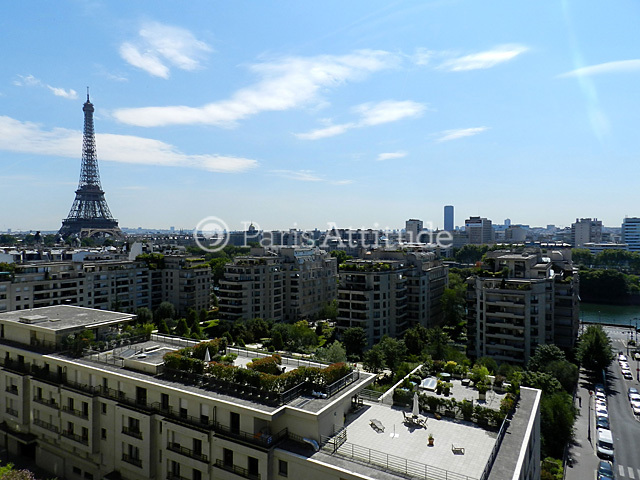 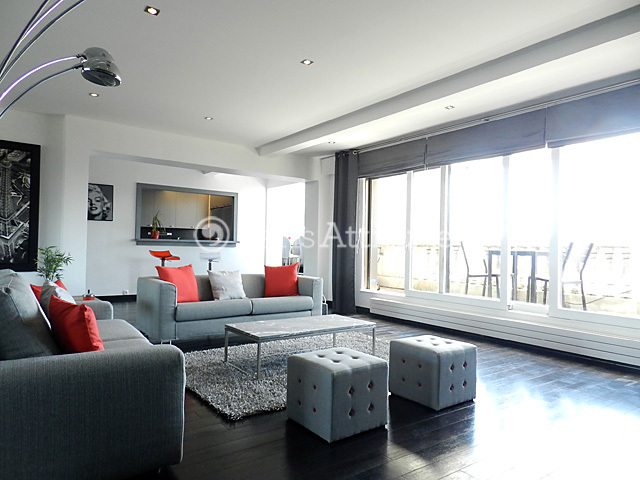 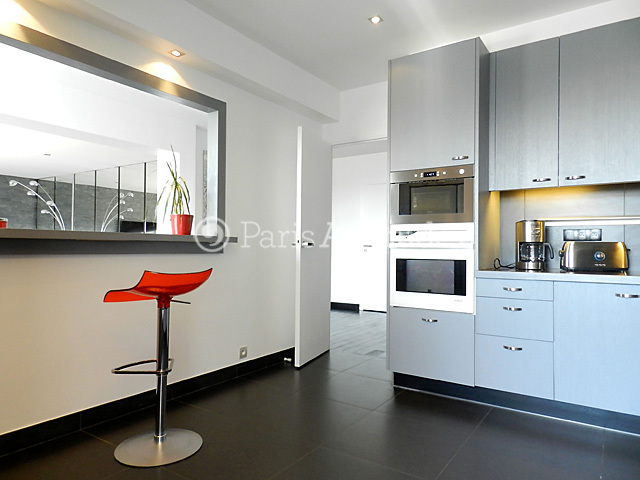 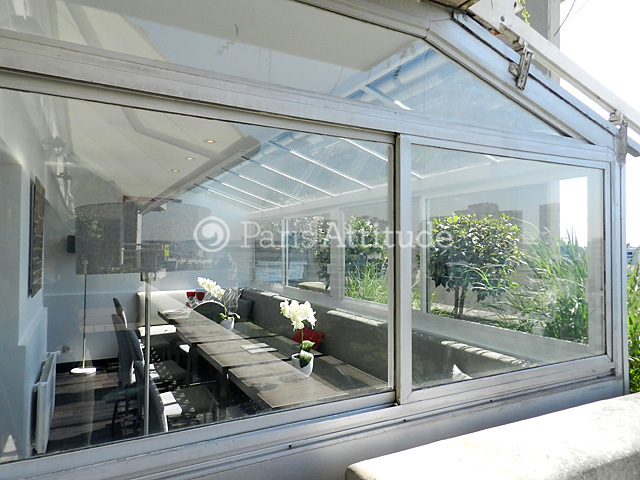 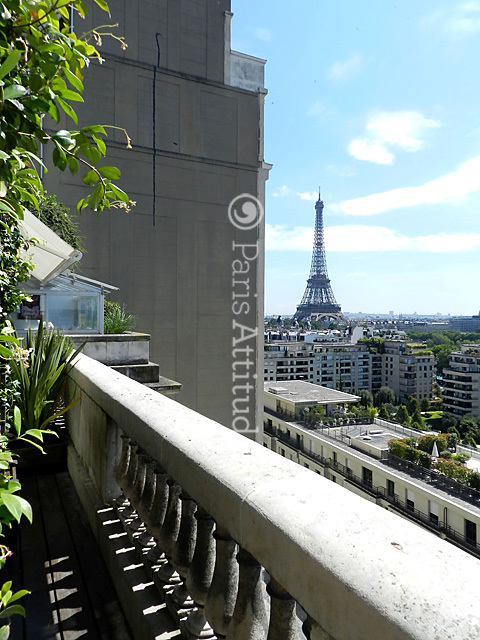 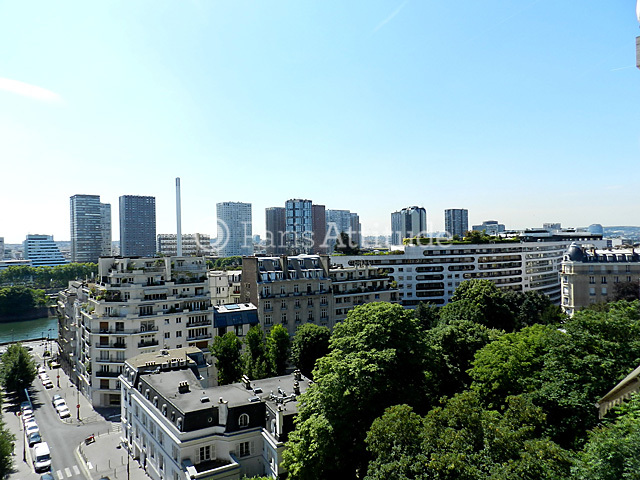 The apartment is close to the Trocadero and has a beautiful viw on the Eiffel Tower.